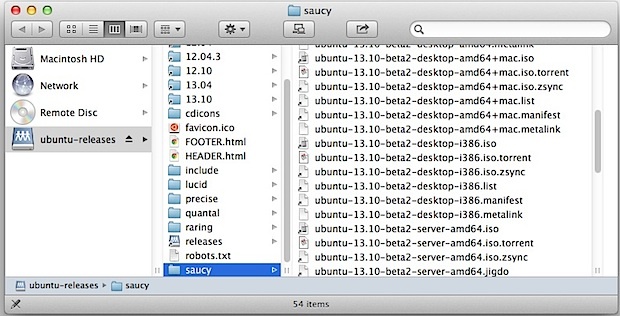 Column View is one of the more useful file browsing view settings in the OS X Finder, but it has a usability flaw that’s initially visible to most users; file names and folders often don’t fit, thus they wind up truncated and become unreadable. Rather than dragging around every single column to accommodate the appropriate file size to make them readable, you can use a super-simple trick instead to instantly resize the columns to fit the names which are visible. 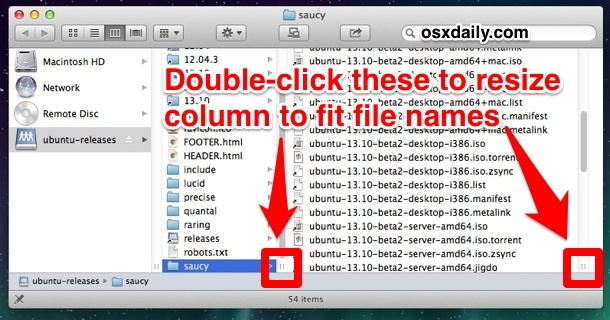 This will instantly snap the column to fit file names. For those who use Column view often, don’t forget that holding down the “Option” key will set that column size as the default for that specific Finder window and/or folder. Thanks to Stefan for the excellent tip idea! It should work in all versions of OS X, give it a try. Column view is useless without an auto-resize option.. big waste of time. Agree with George.. this is 2015 and the mac finder still blows. Huge waste of time trying to navigate column view if you can’t see the entire name. Why doesn’t it auto-resize????!!!!. While we’re at it, how about viewing in columns by “date modified”? Windows is still better at viewing files and the fact you can rename or move files in the open dialog is also BETTER. Maybe by 2020 Apple will have a patch. We are going to macOS Sierra and I think We still won’t have auto-resize option. After apple killed Xtrafinder and Total finder They should give us what those apps used to do. At least They are implementing folders on top. This is all fine and dandy if you’re in Column mode, but there are 3 other modes. Not knowing the names forthe first two, I’ll nick-name them “icon,’ ‘name,’ ‘Column,’ and ‘Cover Flow.’ I routinely work in the second mode, ‘name’ mode, and none of what’ here applies at all. Likewise, why oh why does it not auto resize to longest file name? This makes no sense. Please, please, please let something be done. It undermines all my “Macs are just better” arguments when a stupid thing like this comes along. Don’t prove the Windows monkeys right. In column view, the width of a column should be a property of the folder whose content that column is showing. It could be implemented easily, in the same way the location of icons in icon view is stored in the folder’s metadata. Thus, if column n contains folders A,B,C and B is selected, column n+1 shows the contents of folder B and its width, as set by me, is a property of folder B. Then if I click folder A (in column n), column n+1 now shows the contents of folder A and its width should change to whatever width I chose when I last looked at folder A. That would be a friendly solution. This has been bothering me for YEARS so glad I did a search & found exactly what I needed to know. (Would be useful if it just did this automatically, though.) Thanks so much!